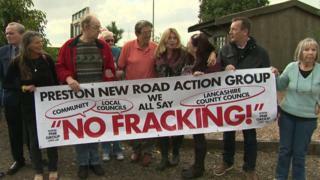 Anti-fracking campaigners have urged judges to quash a government decision to permit fracking in Lancashire. Preston New Road Action Group (PNRAG), along with environmental campaigner Gayzer Frackman, have taken their fight to the Court of Appeal in London. Communities Secretary Sajid Javid approved Cuadrilla's plans to frack at its Preston New Road site in Little Plumpton, Lancashire in October. However, protesters claim the decision was both unfair and unlawful. Hydraulic facturing or fracking is a technique designed to recover gas and oil from shale rock. Developer Cuadrilla's planning application was refused by Lancashire County Council in 2015, but after an appeal and a public inquiry horizontal fracking was granted by Mr Javid. The legal challenge follows defeat at the High Court in April when the appellants failed to persuade a judge in Manchester to overturn his decision. At the start of a two-day hearing David Wolfe QC, on behalf of PNRAG, submitted that "the secretary of state, through his inspector, misunderstood key local and national planning policies". "using a wildly different test for assessing the impact on the quality of life of those living nearby"
Mr Frackman, from Blackpool, said, in a statement before the hearing, the legal challenge tests the government's '"drill first, ask questions later" approach to fracking. He added the government "must be held to account for failing to protect UK citizens from the health impacts of fracking and the untold damage it will cause to our environment, our climate, and those living near the site in Lancashire". A spokeswoman for the action group said it "trusts" the decision will be found "unsound" and Lancashire County Council's original decision will be reinstated. The judges will hear arguments on behalf of both the communities secretary and Cuadrilla that the challenges by PRNAG and Mr Frackman should be dismissed. Video What is it like living near fracking?